Thank you to all of the incredible women who attended this year’s conference. Thank you to all of the amazing facilitators who shared their expertise with us all. Thank you to the vendors who showed up to share their passions. Thank you to the contributors who either provided a raffle item or service. About Maria: A “passionate tsunami of love” who entertains as she teaches, Maria Salomão-Schmidt, MBA was an Oprah Show guest. She cuts through the crap and gets to the heart of the matter through her humor, intuition and zaniness. She’s a powerful international intuitive life coach, speaker and author who helps ignite her clients’ life purpose. Maria graduated from Boston College, Simmons University (GSM) and Rhys Thomas Institute of Energy Healing. She’s a Reiki Master Teacher and expert in NLP, EFT (tapping), Chakra Balancing and Full Spectrum Healing. Her next book on how to use your energy to dramatically shift your life, Finally Full of Yourself! : Unlocking Your Spiritual DNA just came out this November (2016). Maria loves languages, yoga and meditation. She lives outside of Boston with her husband Douglas, their five children and four rescue dogs. About Kim: Kimatra Maxwell, LICSW is a woman who believes in making people stronger, on both the personal and community level. To make this possible, she rolls up her sleeves as a clinical social worker, an active community member, an entrepreneur, a life coach, and a loving spouse. Kimatra is the founder Connecting To Greatness, a mental health private practice aimed at empowering individuals. through counseling, coaching, and local events providing education and resources. She is also the proud owner of Precision HR Management LLC design to support small business find solutions to their human resources and coaching needs.A Licensed Independent Clinical Social Worker, Kimatra currently serves as the Massachusetts National Association for Social Workers Central Region Board Representative. She also serves as a board member of The Arc of Opportunity Central Massachusetts, which helps adults with intellectual disabilities work and lead more fulfilling lives. Not done with politics, she is the Ward 4 Chair for the Fitchburg Democratic City Committee and an alumnus of Emerge, Vote Run Lead, Mass-Alliance, and Commonwealth Seminar organizations dedicated to training individuals to run for office. She lives in Fitchburg Massachusetts with her husband Michael Maxwell. Who are you? Beyond what sKociety has told you? Beyond what your friends told you? Beyond what your family has taught you? How is what you've been taught holding you back from the real you? In this interactive workshop, we'll confront these barriers, set new intentions for our future and set off on our journey on discovering the real you. About Chantel: Women In Action Inc. was founded by Chantel Bethea in 2010. She is a native of Atlanta, GA and a current resident of Worcester, MA. She is also a wife and a proud mother of four beautiful children. Empowering women has been a longtime passion of hers. Through several years of mentoring/empowering experiences and countless conversations with women, the concept for this organization was developed. Throughout the years she has seen the growing need for positive female role models. She is honored to serve the women in her community by helping our women. Lastly and most importantly, Chantel credits her mother for giving her the spirit to give back. She feels as though she would not be who she is today without her mothers' love and support. She states, "My mother has built her life around helping others and has certainly been the inspiration for my program." Women In Action Inc. was developed to empower the lives of women, as her mother has continuously done in her life. Chantel received the Unsung Heroine from the Massachusetts Commission on the Status of Women in 2015. She also received an award from the Worcester Business Journal for the 40 Under 40 Awards in 2015. Chantel also was the Hometown Hero for Worcester Magazine in 2015. You will leave here with a better understanding of how to plan and lay down the foundation towards completing your goals Receive tools to assist in completing your goals Talk with peers about the challenges or road blocks that they have encountered. When I met Grace I knew by her radiant energy and her passion for growth that she was someone that I needed to get to know. 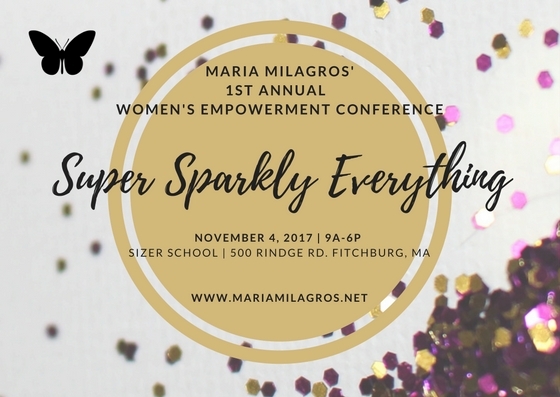 I am beyond excited that she agreed to join the team at the Super Sparkly Everything Women's Empowerment Conference. Grace is a singer, storyteller, writer, and healer from Dublin, NH. She studied music, education, and African American Studies at Mount Holyoke College. She is a certified Reiki Master and trained in traditional Sacred Temple Hawaiian massage. Her most recent writing has been published in Yankee Magazine ad she has performed with the Boston Pops, as a soloist in Boston's Black Nativity, and is a member of the Tara Greenblatt Band. She has been invited to share her stories at events in New England and on The Moth. Grace is interested in exploring feminine archetypes in performance and in groups as a means of gaining self awareness and finding our true nature. During this extraordinary activity we will explore archetypal roles of being a women to gain self awareness and develop a greater sense of how we can support each other as a community, as we evolve as individuals. You can email Grace at galdrich33@gmail.com . About Cera: Cera Hawkins has been working with people recovering from various types of trauma and addiction for fifteen years through Yoga, Meditation, Massage Therapy, and Chakra Balancing. She is passionate about partnering with others to enhance their experience both on and off their yoga mat. Practitioners create their own sacred safe space to heal and replace limiting habits with healthy empowering practices. Clients both in a group and in an individual setting, receive the benefit of Cera's intimate knowledge of anatomy and physiology to ensure their practice is individually tailored and safe. This approach has proven to be effective in the growth and strength of each person's practice. Clients who receive individual Chakra analysis and alignments are able to access deeper parts of themselves and safely explore the "why" of their habits. Energy balancing also makes it possible to let go of old traumas in a safe way to allow for growth. This is a beginner level Hatha class that will focus on alignment and healthy body mechanics while moving through a series of poses designed for the novice and experienced alike. We will end class with a relaxing guided meditation. Participants should bring their own yoga mat as there are few to borrow. Wear loose comfy clothes and bring water. About Priscila: A native of Clinton, Massachusetts, is a social entrepreneur, activist, and inventor whose social enterprise, SproutChange, started as a hashtag in February 2016 to influence a grassroots advocacy movement in consumer education around alternative medicine, organic agriculture, sustainability, and social/food justice. Today SproutChange has gone from a grassroots movement to a budding start-up which was recently matched with Ropes & Gray global law firm to lawfully officiate its inception. In the last two years since the #SproutChange movement, Priscila has graduated from Eden Valley Institute in Loveland, Colorado where she attained her Lifestyle Coaching certificate in April 2017. Priscila’s coursework at Eden Valley focused on natural remedies, organic farming, hydrotherapy, massage, and vegan/plant-based meal preparation. Upon her return home to Clinton from Eden Valley, Priscila held a few workshops at faith-based organizations and then traveled to Europe to apprentice as a sustainable organic farmer. She spent July through September 2017 learning permaculture farming at Le Mas Perdu in southern France and Wasserburg Turow in northern Germany, followed by a practicum as a lifestyle coach working 1-on-1 with clients in Paris, France before returning back to Massachusetts mid September 2017. To date, Priscila has held several public speaking engagements and workshops including an Employee Wellness workshop at YWCA of Central Massachusetts, been featured on local Worcester TV show “Exposure with Mosher,” was a panelist and presenter at the Second Annual New Economy Summit held by the Worcester-based Social Venture Collaborative and a speaker at “Women & Wine: Entrepreneur Networking” event at Becker College sponsored by the Yunus Social Business Centre and Center for Women & Enterprise. Priscila was raised as a Nutritrarian and is currently practicing a healing foods plant-based diet and lifestyle. As a product of a multicultural upbringing, she’s a polyglot (Spanish, Italian, and French) who loves learning about the local natural remedies and herbs wherever she travels. She is a multi-generation herbalist who in her free time loves foraging for wild medicinal herbs, conducting holistic test-kitchen experiments, and creating her own therapeutic formulas for skin, physical, and mental well-being. To learn more, follow her social enterprise on social media @MySproutChange. Basic introduction to healthy living and the 8 laws of health needed for optimal health which promotes mental health. Thank you to all who made the day SO magical. Incredible women + Amazing speakers + Generous donations and contributions + Open Minds + Willing Hearts = Empowerment at it's best! Thank you! **Market Basket Corporate Office Thank you Theresa! Kimatra and I met at a meeting where she bravely discussed the need for more support around natural hair for women of color. I instantly connected to her desire to teach and her desire to empower. She is honest and real and pushes me to be the best version of myself every day. Kimatra is an active member of the Fitchburg community, a Master’s level social worker, a Massachusetts National Association of Social workers board member, an entrepreneur and a former candidate for State Representative for the 3rd Worcester district 2015-2016. Kimatra graduated from Lehman College with a Bachelor of Arts in Social Work and Political Science, and a Masters of Social Work from Hunter College-Silberman School of Social Work in New York City. She spent 18 months in Korea teaching English at a language school in Seoul. She is married to Michael Maxwell. She is also the founder of Connecting To Greatness aimed at providing women with tools and resources to be their best and most authentic self. Most recently, Kimatra also launched Precision HR Management -partnering with small businesses to provide HR solutions. Get your tickets so that you can be sure to be a part of her 'Confronting Negative Self-talk' class. Scherrie began sharing her story of survival and personal responsibility and we clicked. She understands the need to take hold of our precious lives and live them to the fullest. Scherrie is the founder of Diabetes Kare Consulting, RN, BSN, CDE, CDC National Diabetes Prevention Program Trained Lifestyle Coach, AHA CPR Instructor and Pure Haven Essentials Independent Consultant. She specializes in acute and chronic disease management, health education, promotion and prevention. She is also the producer and host of Talk Me Healthy with Sterling-Lancaster Community Television and a member of North Central Massachusetts Chamber of Commerce, Montachusett Area Rotary, Massachusetts Diabetes Prevention Program Network, American Association of Diabetes Educators, American Diabetes Association and American Heart Association. When you buy your ticket and take her class you will learn 'The Secret to Living A Long & Healthy Life'. Shantel Woodson is available for hire to sing at your next wedding or event. layouts and paint color assistance. www.TheOccasionalScallop.com, please come check us out! to be able to share that with our community. 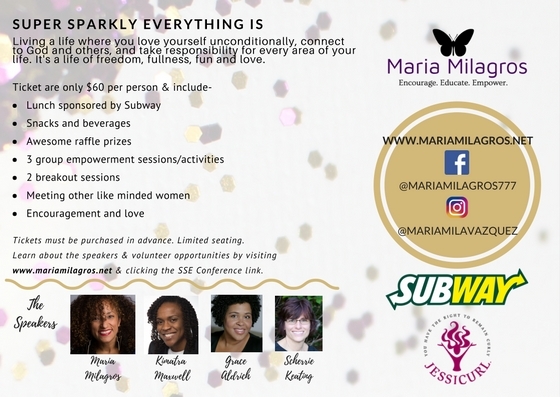 Living in your Fullness: This whole group session will empower you to tap into everything that makes you unique and amazing, as well as everything that reminds you that you are love, so that you can begin or maintain living a full life of gratitude and of love. Living With Desire with Grace A.: Through, story, writing and inquiry, we will learn some simple tools to help us hear our desires more clearly and unite mind, body, and spirit to bring our larger purpose into focus. The Secret to a Healthy and Happy Life with Scherrie K.: Using her own personal story and her experience Scherrie will guide you through the importance of discovering your why and the power contained within to create and live a healthy and happy life. Confronting Negative Self Talk with Kimatra M.: In this interactive class, Kimatra shares her quest for Emotional Freedom by confronting Negative self-talk, taking emotional responsibility, learning from and managing your feelings and creating a path to emotional freedom. The Beautiful Struggle with Maria Milagros: We’ll discuss the way we perceive life’s challenges, difficulties, frustrations and failures and how altering our perception will allow us to see life as the beautiful journey it is. You will leave feeling empowered to rewrite the story of your life to benefit your next chapters and live the life of love and freedom that you deserve. Let’s Do this Together facilitated by Grace A.: During this extraordinary activity we will explore archetypal roles of being a women to gain self awareness and develop a greater sense of how we can support each other as a community, as we evolve as individuals. Process, Prepare and Plan facilitated by Maria Milagros: An interactive conversation that will encourage processing of the day’s learning, growth and a-ha moments. We will also co-create action steps to begin implementing the new information with our current lives. No Holds Barred Q & A: No question is off limits during this Question and Answer segment with our panel of speakers.